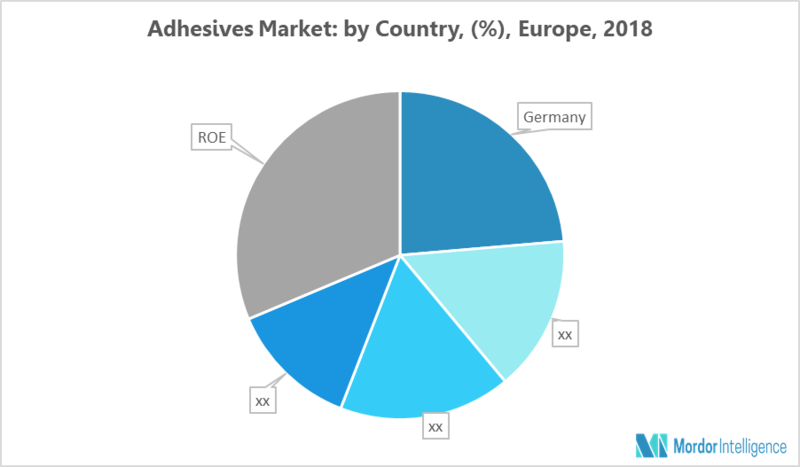 The Europe adhesives & sealants market is expected to grow at a CAGR of 4.65% and 2.84%, respectively, during the forecast period (2018 - 2023). Germany is estimated to lead the market owing to its growth in the end-user industries of adhesive and sealants. Adhesives & sealants have become a prime technology component of automotive applications, as they are continuously replacing traditional bonding or adhesion methods. Moreover, the recent advancements in the adhesive technologies in the region are aiding automobile manufacturers in the production of lightweight and fuel-efficient vehicles. The focus on minimizing carbon emission and enhancing fuel economy, by reducing vehicle weight, has provided an impetus to adhesives, as a bonding material for manufacturing of automobiles. Pressure sensitive adhesives (PSAs) are continuously replacing mechanical fasteners. With the increase in vehicle production over the years in addition to the above-stated factors, the demand for adhesives & sealants in the automotive industry is also expected to increase. Stringent environmental regulations regarding VOC emissions and the volatility in prices of raw materials are some of the restrains for the growth of the market. Healthcare is the fastest growing segment in the adhesives market. Different types of adhesives, such as epoxies, acrylics & urethanes, are used in surgical instruments, hospital equipment, bumpers on the bottom of crutches or walking canes, and plastic soles at the bottom of the cast boots, in order to bond metals, plastics, rubbers, and other bonding material. With the growing population and the increasing numbers of adults over the age of 50 in Europe, the healthcare sector is growing in the region. This is expected to drive the demand for adhesives and sealants in the region. In Europe, Germany represents the largest economy and is also expected to expand at the highest CAGR during the forecast period. The revenue generated from the German automotive industry is nearly 20% of the revenue generated by all the industries in the country. The various applications of adhesives & sealants in the manufacturing of cars are expected to create the demand for adhesives & sealants. The market is expected to grow simultaneously with the growth of the automotive industry in the country. Moreover, the growing electronics & telecommunications sector has witnessed an 11% increase in the revenue from the sales of consumer electronics. Hence, demand for adhesives used for coating and bonding is expected to rise in the country. With the growth of healthcare, construction & building, and other sectors in the country, the demand for adhesives & sealants is expected to witness a rapid growth. March 2018: Henkel Adhesive Technologies accelerated the commercialization of tailor-made materials and it offers a comprehensive service for 3D printing solutions. Major Players: Sika AG, 3M, Arkema Group, DowDuPont, and H.B. Fuller Co., among others.